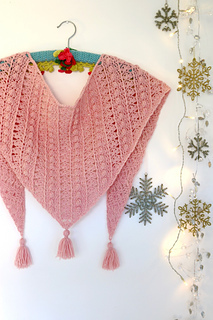 With lots of lovely textured stitches, this shawl features a mix of waltzing flower clusters and sugar plum bobbles to hold your interest to the end. 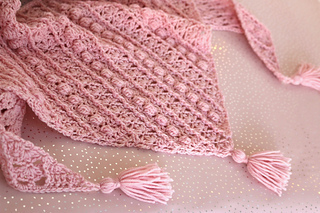 A full written pattern for a V shaped shawl. 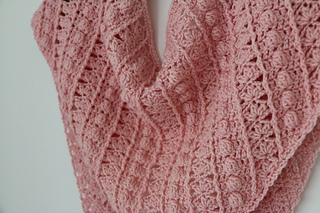 An intermediate level written pattern using basic and intermediate stitches. 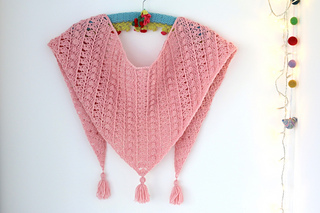 Experience with front and back post treble crochet (dc - US) would be useful, but a tutorial link is provided. Or size required to match gauge. 22 sts and 10 rows in 10cm (4”) after blocking.